From a proposal to reopen offshore drilling to today's announcement on lowering fuel efficiency requirements, the Trump administration is taking no prisoners in its scorched-earth policy against the kind of environmental regulations Californians have long prized and other states have replicated. And as the current federal government attempts to yank the state's progressive environmental policies up by their very roots, those with a stake in their success have ratcheted up their public statements of disgust to near-Trumpian levels. "I am sick and tired of these fake conservatives who believe in states’ rights to make their own policies - as long as state policy is to pollute more. If you want to clean up your air, they throw federalism right out the window. I’ve had it with so-called pro-business conservatives who ignore what actual industry leaders say is best for business. The car companies’ own lobbyist said they hoped the administration would “find a solution that continues to increase fuel efficiency standards.” Let’s be clear: this is a stupid policy and no one asked for this. Businesses prefer certainty - not policies that change with the whims of each new White House." Schwarzenegger has been feuding with Trump over a host of issues for some time now. The former governor of California and star of such movies as "Terminator," "Terminator 2," and "Terminator 3" (as well as "Kindergarten Cop") has a serious environmental legacy at stake. 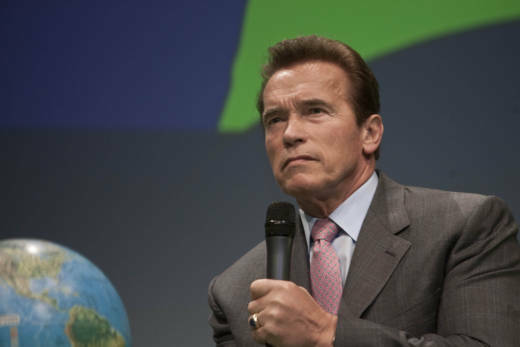 It was Schwarzenegger who signed AB 32, the state's landmark -- and effective -- law that has reduced the greenhouse gas emissions that drive climate change. It was only last month that the California Air Resources Board released data showing that 2016 emissions had fallen below those produced in the state in 1990, a milestone reached four years ahead of schedule. Should today's EPA plan to revoke the exemption allowing California to go above and beyond federal requirements for auto emissions actually become law (there's already a lawsuit, naturally), that could all but sink the state's effort to slash emissions another 40 percent by 2040.